Kevin Kline’s Tony Award®– winning performance in Noël Coward’s Present Laughter, first produced in 1942 with Coward himself in the leading role, comes to PBS Friday, November 3rd at 9 p.m. (check local listings) continuing the GREAT PERFORMANCES marathon within PBS’s Fall Broadway’s best lineup. Noël Coward’s Present Laughter follows a self-obsessed actor in the midst of a mid-life crisis. Juggling his considerable talent, ego and libido, the theater’s favorite leading man suddenly finds himself caught between fawning ingénues, crazed playwrights, secret trysts and unexpected twists. Noël Coward’s Present Laughter joins She Loves Me (October 20), and Indecent (November 17), and Irving Berlin’s Holiday Inn (November 24) as part of PBS’s Broadway’s best lineup, all directed for television by Emmy Award®-winner David Horn, executive producer of both GREAT PERFORMANCES and THIRTEEN’s local Theater Close-Up series. The four titles are co-productions with theater streaming service BroadwayHD and THIRTEEN PRODUCTIONS LLC for WNET. Also airing as part of the Broadway festival are GREAT PERFORMANCES encore presentations of In the Heights: Chasing Broadway Dreams (November 10) and Hamilton’s America (in December), up-close looks at the making of Lin-Manuel Miranda’s Broadway hits, In the Heights and Hamilton respectively. The performance earned Kline the best actor honors at the 2017 Tony Awards, Outer Critics Circle and Drama Desk Awards. The cast is also headed by three-time Tony® and Emmy® Award nominee Kate Burton(Scandal, Grey’s Anatomy), Tony Award® nominee Kristine Nielsen (Vanya and Sonia and Masha and Spike), and Cobie Smulders (How I Met Your Mother, Jack Reacher: Never Go Back) in the Broadway debut which earned her the Theatre World Award for Outstanding Broadway Debut. Stage direction is by Tony Award® nominee Moritz von Stuelpnagel (Hand to God). The ensemble of Noël Coward’s Present Laughter includes Matt Bittner, Ellen Harvey, Peter Francis James, Tedra Millan, Bhavesh Patel, Reg Rogers and Sandra Shipley, with Kelley Curran, Rachel Pickup, James Riordan, and David L. Townsend. 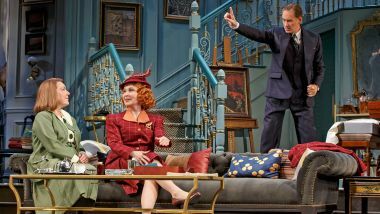 The creative team for Present Laughter features set design by Tony Award® winner David Zinn, costume design by Tony Award® winner Susan Hilferty, lighting design by two-time Tony Award® nominee Justin Townsend, sound design by Fitz Patton, and hair design by Josh Marquette. Casting by Telsey + Company. Noël Coward’s Present Laughter was produced on stage by Jordan Roth, Jujamcyn Theaters, Spencer Ross, A.C. Orange International, Eric Falkenstein, Grove Entertainment, Bruce Robert Harris and Jack W. Batman, Stephanie P. McClelland, Harbor Entertainment, Joe Everett Michaels / Robert F. Ryan, Daryl Roth. For BroadwayHD, this performance of Present Laughter is produced by Stewart F Lane; Jordan Roth, Stewart F. Lane and Bonnie Comley are executive producers.